We wrote to you recently about the benefits of being an ASI reader and getting ‘inside information’ first. You may know that January heralds arguably one of the year’s biggest and most important international coin show in New York. Last January was big; this year was bigger. Not just for us, but for the market as a whole. It reinforces the rare coin market appears to be on a long bull run. A glittering (literally) tray full of gold coins was presented to us just last week - a cornucopia of riches. The selection is currently being fully described and processed, but I can bring you some highlights now, before they get offered more widely. I strongly recommend if you are looking to build a coin portfolio or boost an existing portfolio, that you contact us quickly. We can then select appropriate items for you before they disappear. 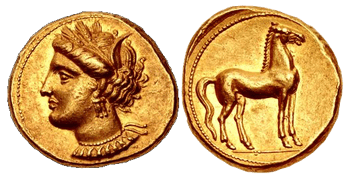 Some of the highlights include pieces like this magnificent Carthage gold Stater from 350-320 BC. Not only is it positively glowing with history, it is in superb (EF) condition and extremely rare. This is the epitome of a highly collectible and certainly investment-grade coin. It sports the head of Tanit, the Punic and Phoenecian goddess, wearing wreath of grain ears, a triple-pendant earring, and a necklace with eight further pendants and is priced at £19,000 (approx. $27,590*). 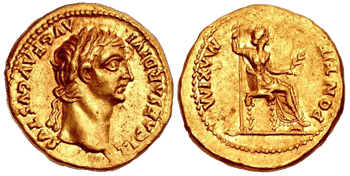 From the age of Imperial Rome comes this next item – a gold Aureus from approx. 36 AD and the rule of Emperor Tiberius. Again, the coin is in superb (EF) condition and shows a very strong portrait of Emperor Tiberius. Struck in around 36/37 AD at Lugdunum (modern-day Lyon), in Gaul. This, and its silver equivalent are thought to be the 'Tribute Penny' referred to in the Bible. The story goes that Jesus, referring to a "penny" asked, "Whose is this image?" When told it was Caesar, he said, ''Render therefore unto Caesar the things which are Caesar's and unto God the things that are God's" (Matthew 22:20-21). This wonderful and historical coin is available for £7,450 (approx $10,818*). To secure these coins, or to find out about the rest of our range, call us at 800-831-0007 or send us an email. Do bear in mind, however, that rare coins of this quality are in great demand, so please don’t delay. *Prices listed are subject to change due to market fluctuation and product availability.